happy holidaze, and a cbldf update!!! Wow! People came out and bid our Aspen, Wildstorm, art battle pieces through the roof!!! We managed to raise an astonishing $4732.58!!! Once again it was a blast and all of us here at Wildstorm would like to once again thank Aspen for participating! It was all for a good cause, and those guys were amazing competitors! Also I would like to say Happy Holidaze to all of you! I'll be heading out of town so I won't be posting for awhile but I leave you all with the above piece. It also will be auctioned off by the CBLDF, as Jim and I did it during the sketch duel in Chicago this past year. Voodoo, and Zealot for you guys! 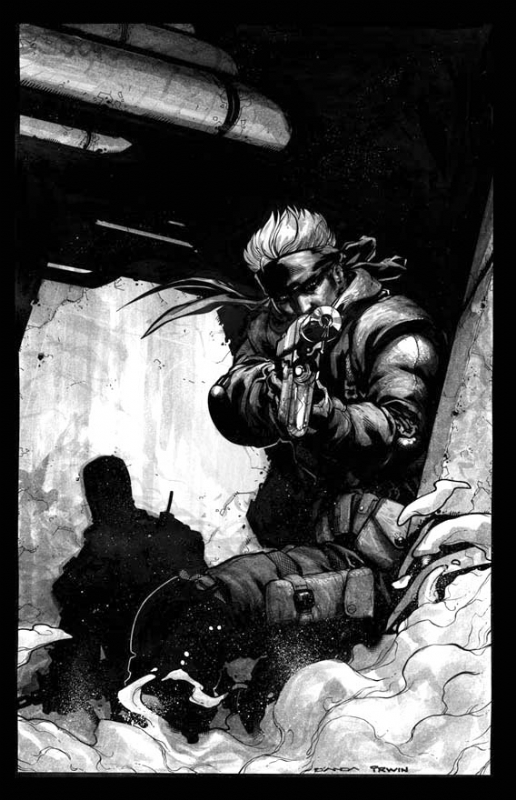 There's alot of big Wildstorm goodness just around the corner coming next year! For all you die hard fans, I just know it'll make you all very happy! So, till next time, I wish you all a special (insert holiday of choice) to all of you!!!
" you got the look " WOOT!WOOT! I decided to post an image. I'm trying to get a hold of the different brushes in Photoshop. It's getting easier now that I'm starting to find the texture oriented ones. The difference is really refreshing because it allows me the freedom to get a more detailed look simply by making the unimportant areas less important. I have been looking at Frank Brangwyn's work these days. I've definitely enjoyed his work in the past. I guess a lot of it has to do with the mixture of organic shapes with strong outlines. His work feels a bit like Baroque architecture to me. While I can appreciate the skillfulness and delicate quality of a Mucha or Klimt, I love the strong, bold silhouetted shapes and "stain glass" effect of Brangwyn. Vote for Jim Lee here! Vote for Michael Turner here! Iron Gelatomettista Challenger: Michael Turner! 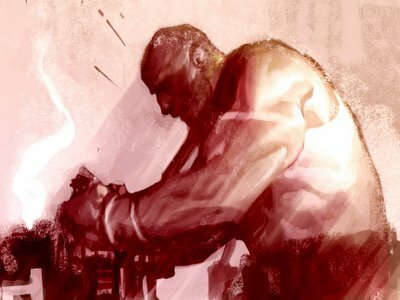 Iron Gelatometista Challenger: Michael Turner! It's with great honor that we welcome today's challenger, Michael Turner! Being one of the biggest names in today's industry, he is here to challenge our very own, Jim Lee! In what promises to be perhaps the biggest challenge ever showcased here, and maybe just one of the greatest battles of all time! The studio battle between Wildstorm, and Aspen has been very close so far with Wildstorm taking 2 of the 3 battles, but to make it interesting we have decided to make today's victory worth 2 POINTS! Therefore, Aspen, under the pencil of Turner can pull ahead for VICTORY! So remember boys and girls you decide the content of what will be drawn today in this thread, and ultimately who will win! WHO WILL IT BE WILDSTORM OR ASPEN!? UPDATE: Nightcrawler and Harley Quinn starting at 2:30! Stay tuned! A little background info for those of you who may be unfamiliar with today's special guest of honor! Michael Turner began his career at Top Cow studios, co-creating the smash hit series, Witchblade. Doing an extensive run on the book he established himself as one of comicdom's brightest young stars! It was then that he went on to create yet another chart topper, his own series, Fathom! A book that would bring him the success to eventually enable him to start his own studio and company, Aspen! Soon thereafter Mike took his first crack at mainstream comics and knocked it out of the park! 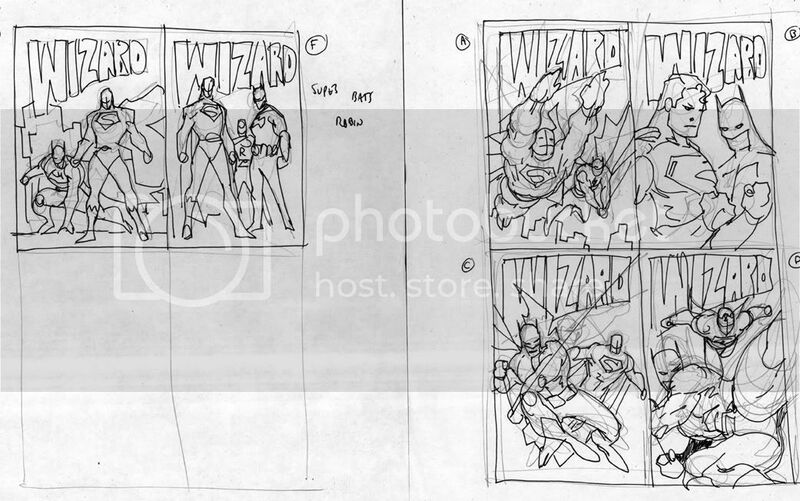 Working on the hugely popular, Superman and Batman comic he and Jeph Loeb, brought back the much beloved Supergirl, and asserted himself as one of the most powerful draws in the comic book industry! He currently publishes his own titles under the Aspen banner, Soulfire, Ekos, and Fathom, and is preparing for what will be a huge event, working at Marvel Comics! So prepare yourself kiddies, today's challenger is no slouch, and you can bet your bottom dollar that today's battle will be one of the all time greats!!! NUFF SAID! Iron Chef! WS vs Aspen, Main Event!!! That's right guys it's on, and going down tomorrow, Thursday, December 8th, at 2:00pm pst! The one you guys have all been waiting for, JIM LEE vs MICHAEL TURNER! The battles up until have been hot and heated, here are the past results! Wildstorm goes into the final round with a slight edge, but with the strength of tomorrows two competitors it could go either way! STAY TUNED!!! I just realized something, and wanted to clarify as to what this site is all about. It's been about two years that I wanted to do a series of artworks based off of my wife's inspiration. The photo's posted are some of the reference that I will be using, BUT, I just realized that without the art, the site comes off incomplete, or "misleading". I will be posting art on there, alongside many of the photos in the gallery section, and hopefully they'll look pretty cool, and I can't wait to get em up. So for now the site may be coming down for some restructuring. However the messageboards will stay up. Hey guys wanted to give a quick heads up. I have a new forum located over at my wife's site, silly I know, but come by and check it out. 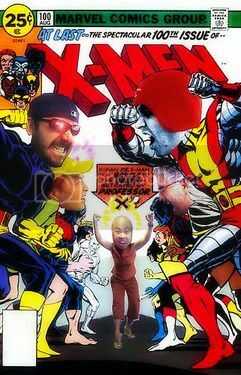 There's a forum for comics discussion, and all kinds of other crap. I know I should have my own site, but I just don't want to have to do updates, lol! So for now I'll be squatting over there. In a bold move I've decided I may try my hand as a world famous bull fighter. It's always been a secret dream of mine to stare the beast in the eye, and I figure there's no better time than now! I've been practicing weekly, using both Rich and Carlos as my bulls. Only once has Carlos got me with one of his horns, he's quite wooley! It's a bold career move, but you only live once! Beware bulls, there's a new matador in town, and he goes by the name of Alé! update for yo moms yo! hey guys wanted to let you all know that our grand finale studio art battle of Jim Lee vs Michael Turner will take place next Thursday! Mark your calendars! Also wanted to let you all know that Skye Runner is coming along swimmingly! I'm going to get some stuff up this coming week for sure! Next week will be a good one to be on the blog so make sure and check in regularly! Anotha little sketch. I only give myself an hour on the lineart, and an hour in photoshop. Oh how I want to learn to color, lol! Paint Friday went well! I realized just how crappy I am, doh! I think Scott probably took first, Jim a close second, Sandra's was very nice, and Carlos, well Carlos likes to start over too much, hehe! Mine? Blehhh. I'd really like to learn how to use those tools though, and this definitely won't be my last attempt. Hopefully I can absorb some knowledge from Iwahashi. We should be able to get them scanned, and maybe posted. Till next time, have a good weekend! been gettin' work done, and then some. So i figure i could post a little more often. Show some of my recent little warm up doodles. Above is a batgirl i did with dyes. Came out a little janky, but hey, it's a learning process. Today is painting day! We're all gonna jam out with our paint out! Maybe we'll post our attempts :) . Peassss! Belated Birthday Treats Originally uploaded by Gelatomettista2. I've had this scan since the summer. 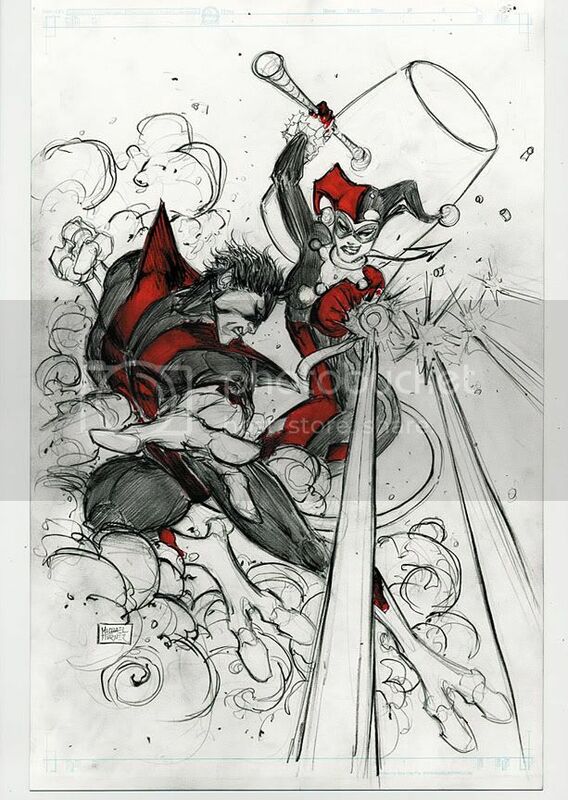 It's a birthday gift for a bud of mine; we celebrated during the SDCC but I wanted to get the piece framed so it sat in the office til we saw one another again (couldn't well post it before he saw it in person). We finally got together again so now I can post this sucka online. He's a big Wonder Woman fan; so much so that his fiancè even resembles Wonder Woman. Some guys get all the luck, right? Anyway, this is the version of Wonder Woman I prefer--big helm, skirt instead of the tights, cape for a more regal pose. And everyone looks cooler standing on a mountaintop. Just got this link recently but some of you may recall during last year's Halloween when a gal up north carved up some pumpkins using my art as reference. Well, she has 2 more very cool carvings up on her blog from this past Halloween. Check em out--they are one of a kind pieces of glowing art and a testament to the power of creativity. Hey guys wanted to pop in give a quick update. I'm hoping to get our main event up and going sometime this week! With two guys at the level of Jim and Mike, thier schedules make it a bit harder than usual to line up. But trust me, it will all be well worth the wait! Above is a little doodle i did of ol bats. Did this one with brush pen, ink wash, and some doc martin dyes. Never really worked in color so this was a good test. My trusty colored blindness makes color very daunting for me. I should be getting some Skye Runner quicktime clips up soon also, so keep an eye out fo that! Talk to ya soon! Absolute Joker and Clear View auction update Originally uploaded by Gelatomettista2. 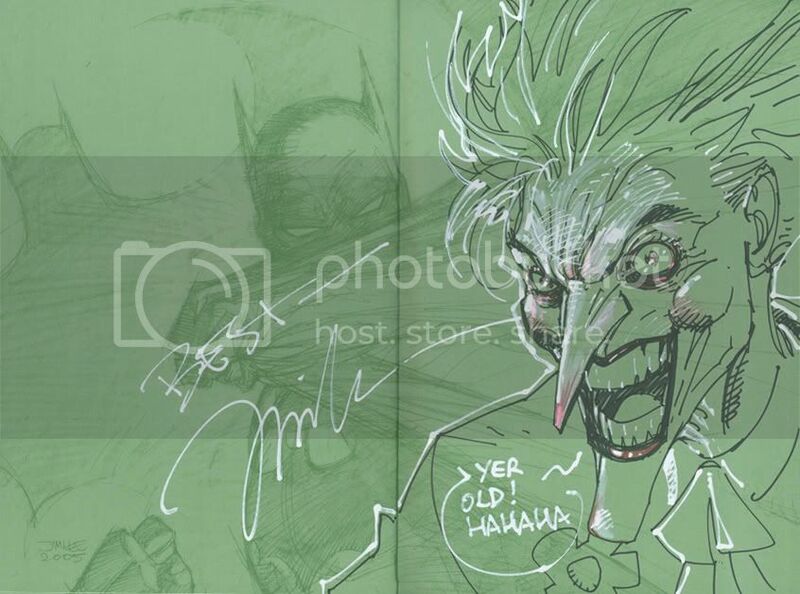 Here is an image of the Joker I added into an Absolute Hush for a buddy of mine who was celebrating his 30th birthday (the dedication has been Pshopped out). Joker seems to work especially well here in the endpapers since the color of the paper fits so well with the color of his hair. Also wanted to add something to the Clear View School auction which is happening this Saturday (scroll down for more info). 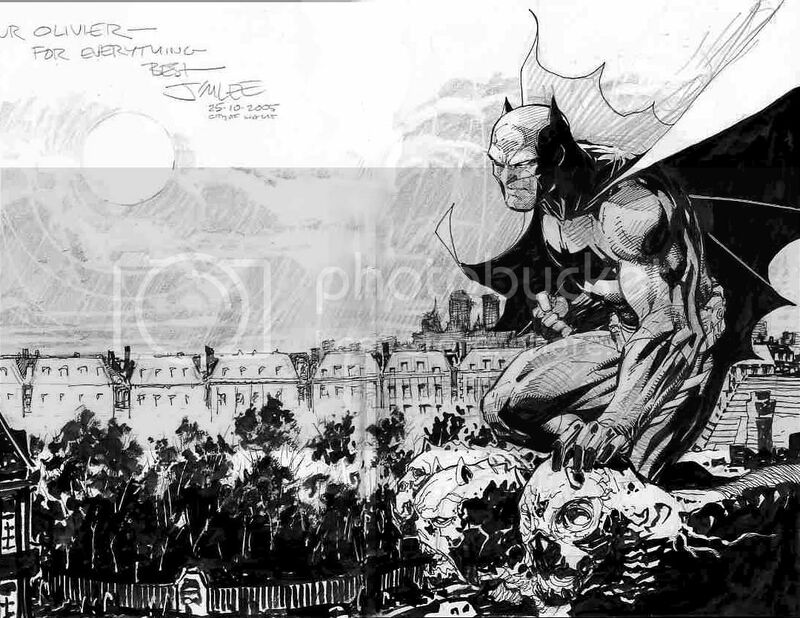 One regular on the blog--Warren--has offered to throw in an All-Star Batman and Robin RRP edition to anyone who outbids him for the Batman piece below (filed under " 20th Annual Dinner Auction for Clear View School"). 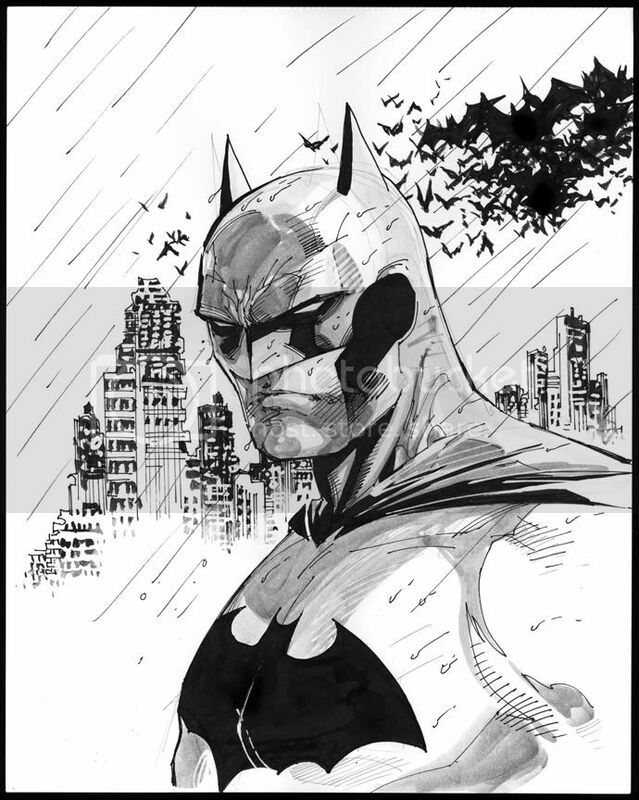 So not only do you get the Batman headshot, an additional headshot of your choice from me, but also an ultra-rare RRP edition of All-Star Batman! ...here's yet another piece I had originally done in black and white just for fun about half a year ago, then Scott (Iwahashi) added inkwashes recently, mainly so I could see and learn from his approach, him coming from a painting background and all. I've been having A LOT of fun lately just messing around with ink-washes, practicing my 'forms' as far as 'greytones' and 'values' are concerned. I consider this to be the same as when you take a photography class in high school or wherever, first you just want to take photos in black and white so you can get used to good composition, exposure, value structures, etc. Once you have a semi-decent understanding of Black and White photography, THEN you can start messing with color ...same thing goes for painting I think, the variations that come with it are waaay to overwhelming to take in all at once, so I find it better, and easier to 'digest' (for me anyway) to understand the 'black and white' aspect of it first. 20th Annual Dinner Auction for Clear View School Originally uploaded by Gelatomettista2. 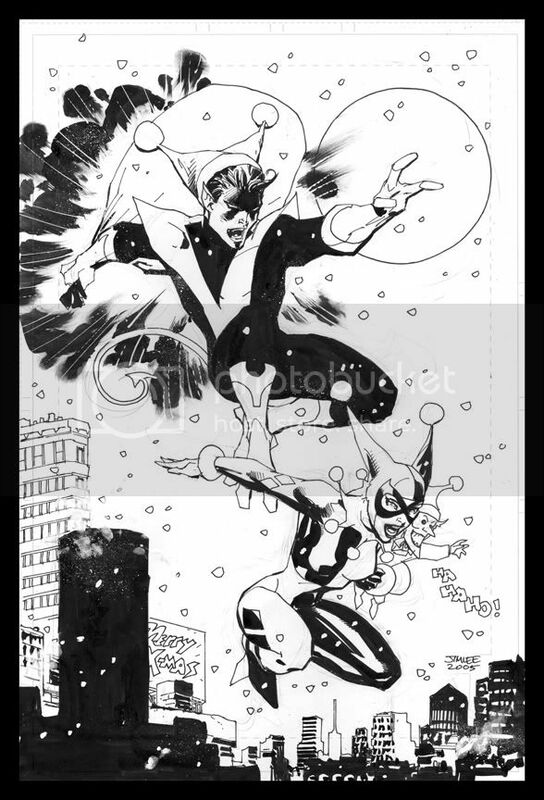 Quick heads up for those who collect comic art--I just donated a piece of art to benefit the Clear View School in Briarcliff Manor, NY. The image is pen and ink with wash and whiteout on 11x14 artboard. Proceeds go to benefit the school which was incidentally co-founded by the late, great Harvey Kurtzman and his wife, Adele. This year, they are honoring Adele for her continued support and good work at the school, which by the way is a day treatment center for autistic and multiply disabled children. They can use every dollar we can offer so please check it out. Below is the address; the auction starts at 6pm EST this Saturday and the charity dinner runs $100 but I do believe you can call in with a bid in advance or perhaps even during the event. I am not 100% sure but the contact person to call who can you give the info is Anna Hlotyak at 914-941-4653. So call in with your bids and inquire about other art that is being auctioned off. Apparently, there are a number of high profile names who have contributed such as Frank Miller and Terry Gilliam and Jack Davis. It's all for a great cause. Bat Treat Originally uploaded by Gelatomettista2. Was in Frankfurt recently for the Frankfurt Book Fair. Was great to be back in Germany and hear the language and see the sights, if only the hotel where I stayed at since I spent most of the 2 days locked away in the convention hall. Bumped into Jeff Smith tho and got caught up and saw once again the power of manga as there were literally hundreds of fans dressed up as characters roaming the site the weekend the Book Fair is open to the public. Here is a larger shot; it was done across 2 pages so the middle gutter is a bit blurred and messy but you get the idea. This is sort of the view from the hotel I was staying at, IF you removed the 2 rows of buildings blocking this potentially wonderful view. Here's a closer look. Hey guys, rather than just dissappearing, I wanted to let you know I won't be around fer awhile. I really have to commit myself to my work. Trying my best to do some solid, enjoyable work for all of you. Rich, and Carlos will keep you all entertained. They're both doing some amazing work! I will post the Iron Chef battles but that's about all the extra time I'll have, and an occasional Skye Runner update as well. So, with that I will leave you with a little bonus Daddy Cool it may take awhile to download but hopefully you'll get a good laugh! PEACE!!! ...how to ruin a drawing 101. I was pretty happy the way that this drawing had come out in just black and white, and it was never meant to be colored on the actual board, so when I applied paint to it, and I had to go 'opaque' on the highlight areas, A LOT of the 'line' detail was lost, same happened with the shadowed areas. The whole time I was painting I felt I was just one step away from TOTALLY screwing it up... STILL, when it's all said and done, for the most part, I'm pretty happy the way it came out. Invariably, there are always a number of things that you wish you could have done differently in a drawing after it's done (damn hindsight!!!) :), and appling color only adds to the complexity of a piece and choices you have to make, but if anything, this has just made me want to practice painting much, much more ....like a wise man once said: "If you're not learning and getting better, you're only getting worse"
so once again I ask, which one do YOU all like more?! ?